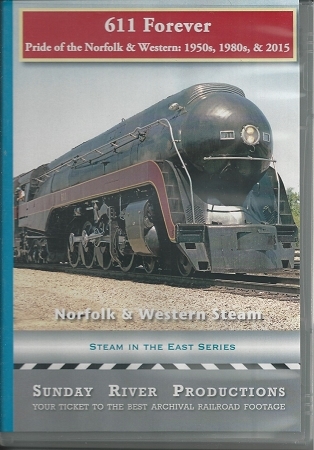 In this action-packed DVD, follow the indomitable #611 pulling famed named trains, The Pocahontas and Powhatan Arrow, in the 1950s, as well as a tragic wreck that nearly became her undoing. Then, in the 1980s, stunning aerial photography hovers above cliffs and snakes through hidden hollers deep in the mountains, tracking #611 through West Virginia and Ohio. The streamlined bullet nose _Jï¾ Class 4-8-4 engine steps out on one of her rare trips across the summits of the Norfolk and Western main line between Roanoke and Portsmouth.Finally, in 2015, witness #611 firing back to life once more. See this marvel of precision engineering and striking beauty, the Norfolk & Western #611_the engine rail fans will celebrate forever.